This Hamptons beach cottage may not be super fashion-forward, but considering Stella McCartney’s tailored style and commitment to animal rights, it makes sense that the designer would opt for a more laid-back look. And if this fresh, summery aesthetic appeals to you, you’re in luck; the Observer reports that McCartney and her husband Alasdhair Willis, the creative director of Hunter boots, have listed the Napeague Bay house as a $30,000 a month rental (or $20,000 after the summer). The couple bought the property, along with the adjacent empty lot, for $1.7 million last August, opting for an Amagansett location not far from where Paul McCartney has owned a large estate since the ’90s. 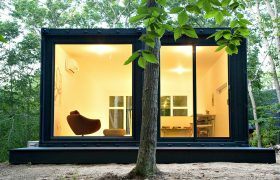 When MB Architecture‘s client requested an art studio near her Amagansett home, she had three requirements–a roughly 900-square foot space, a simple structure that was still “inviting and reflective,” and a limited budget. To achieve these goals, the firm decided to use two recycled shipping containers, about $2,500 each. 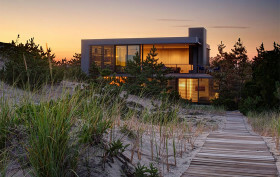 Adjacent to a preserve full of rolling sand dunes and low bushes of Long Island’s south shore (the secluded area is said to once have been used as a film location for desert scenes in silent movies), this passive vacation home by Bates + Masi Architects named “Amagansett Dunes” takes full advantage of its setting. A unique facade of vertical louvers made from twisted canvas strips let marine breezes pass through them to cool the interiors and let in natural light without the harsh afternoon glares. At this Hamptons home, the owners gained a true luxury once it was ready to live in: silence. Project architects Bates Masi paid particular attention to the architectural acoustics in order to limit the noise from the nearby town of Amagansett. Their focus defined nearly every detail of the interior, as well as the materials used. The result is a truly stunning beach house with sustainable, built-to-last materials that contribute to a unique acoustic character as you move through each living space. A new plan to bring affordable housing to one of the Hampton’s priciest stretches has residents up in arms, reports The Post. The town of Amagansett is planning to erect a below-market rate complex that would add 12 two-bedroom and 12 three-bedroom homes to the area, with rents ranging from just $1,100 up to $2,300 a month. The development would mingle with the estates and New York City escapes of the rich and famous, including that of Naomi Watts, Jerry Seinfeld, Gwenyth Paltrow and Scarlett Johansson—just to hame a few. Incredibly, a family of four could be earning as much as $106,200 annually (120 percent of the AMI) to qualify. One of Hollywood’s cutest couples has listed their Hamptons home that is possibly just as adorable as they are. 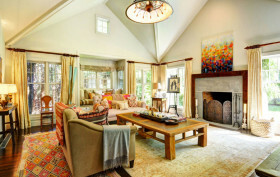 Curbed reports that Naomi Watts and Liev Schreiber have put their Amagansett residence on the market for $5,850,000. The 6,100-square-foot shingle-style cottage is “a charming blend of beachcomber chic and traditional style,” according to the listing for the six-bedroom, 7.5-bathroom home. And in true Hamptons fashion, it’s the outdoor space that’s really magnificent. In addition to the gunite pool, there’s a pool house with a pergola-covered terrace, an outdoor brick fireplace, and sprawling landscaped gardens. If you’re going to live in the middle of nature in Amagansett, a hamlet on the south shore of Long Island, you want to be reminded of the beautiful outdoors as much as possible. That seems to be the inspiration behind this home built by the architecture firm Levenbetts, who designed this property for a couple and their teenage children. It’s been dubbed the 36SML House and was designed as three connected wings—a wing for the couple, another wing for their kids, and yet another one for guests. A driveway cuts through the middle of the home, and there’s a roof deck (with amphitheater seating!) on top. Each wing of the house also creates separate courtyard spaces to accommodate parking space, a vegetable garden, and a play area with a swimming pool. Thoroughly impressed by the exterior? It looks like Hillary Clinton is hoping to add some R&R to her campaigning spree at the end of August. The Post reports that the Democratic presidential candidate and husband Bill are renting a sizable mansion at 44 Broadview Road in Amagansett from Republican art collector Andre Nasser and his wife, Sotheby’s real estate bigwig, Lois. The reported price? Oh, a mere $100,000 for two weeks. 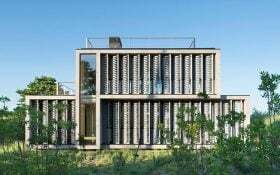 When the owner of an existing house located in the woods in Amagansett approached Stelle Lomont Rouhani Architects, he requested a modern family residence that was as energy-efficient and sustainable as possible. With this in mind, the architects created the Green Woods House, a passive solar design that opens up towards the south, keeping the north-facing façade well insulated and private from the road. Read on to find out how the Bridgehampton-based studio managed to make someone’s dream home a reality with a limited budget and sloppy terrain. Let’s shake off our winter blues by delving into this this stunning two-level home located just steps away from the sea. The Shore House, designed by Bridgehampton-based Stelle Lomont Rouhani Architects, is an elegant weekend retreat located in Amagansett in the Hamptons. Though the structure is very modern in form, according to the architects it was actually designed to bring up memories of summer camp at the beach. Was your summer camp anything like this?